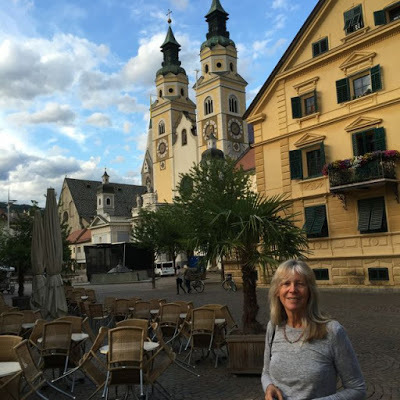 Our Hotel Golden Rossi in Bressanone (Brixen) was a very welcome sight after our mammoth first day on the bike, but even though the map said we were in Italy it still felt very Austrian – in fact most folks refer to it as Brixen – its Austrian name. As the lovely Vivianna on Reception said, “The soil might be Italian, but the brain and heart are German.” Vivianna was from Sicily and explained that this region of the southern Tyrol was still part of Austria until the end of World War I when it was annexed to Italy, and that, “you don’t get to feel that you are really in Italy until you get to Trento” – another two days cycle away. 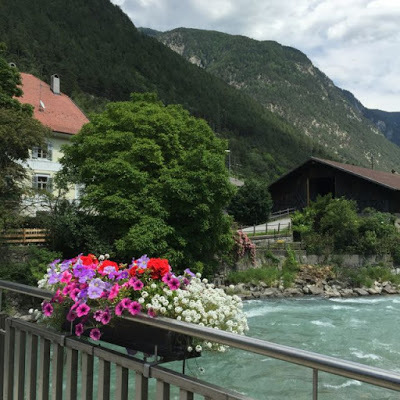 To emphasise her point she also told us that 75% of the locals still spoke Austro/German and the rest a mixture of Italian and Ladin – an old local dialect. Our hotel was a charming 400 year old building in the Tyrolean auberge style with low ceilings and huge wooden beams; very comfortable with a marvellous spread for breakfast. 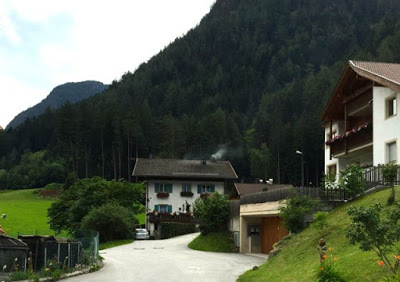 We would have loved to make use of the inviting hotel pool but instead collapsed on the more inviting bed until hunger drove us out to explore Bressanone. 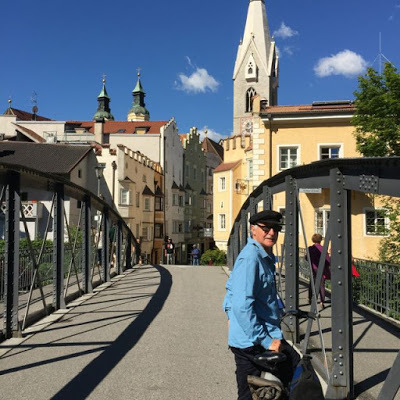 So here we were in Bressanone, being spoilt by yet another delightful town with plenty to keep us occupied for a few hours – we would certainly have liked to have stayed longer. 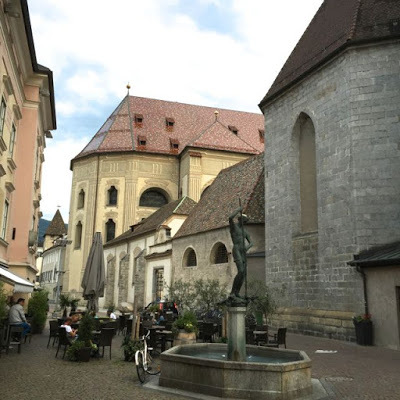 The highlight was the medieval quarter around the central square – the Piazza del Duomo, dominated by the 10th century cathedral, with cobbled streets leading in and out dotted with cafes, restaurants and the obligatory Tyrolean outfitters! Another porky/schnitzel/cabbagey/dumplingy meal and we were off to bed for an early start and Day 2 of our adventure. 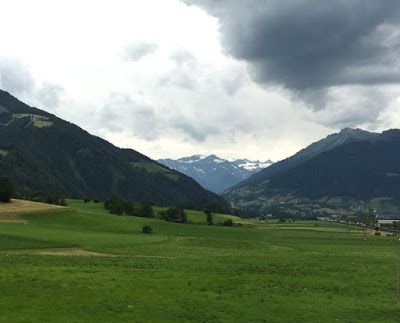 Day 2 was an absolute doddle after Day 1 – only 47 km and mostly downhill – the path following the river. There was only one problem – I was extremely saddle sore. I wondered why my brother had been sending me urgent text messages prior to the start of this adventure; 1. Asking me if I was bonkers, and 2. Had I got any padded shorts? 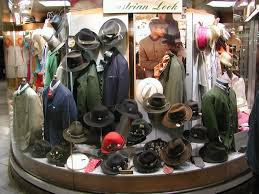 Now, I never knew such things existed but, by Day 2 I could see why one would need them. Not possessing such an item of clothing, I resorted to stuffing 2 spare t-shirts down my shorts. Michael breaking Rule 4 (see previous post for Rules 1, 2 and 3). Your must dismount from your bicycle in a built up area – we wondered why we were getting such filthy looks until someone pointed out a sign to us. Without fail, everyone gets off their bicycles and walks – it now occurs to me that I think you are actually supposed to do this in Mullumbimby too! 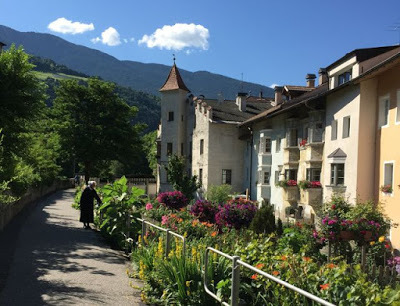 As we headed out of Bressanone on the bike path, I came upon this lovely garden tended by an elderly nun. I stopped, and with hand gestures and smiles she proudly showed me around. 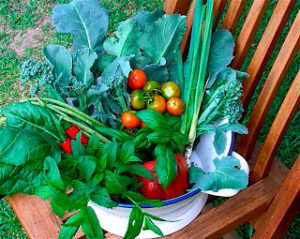 Fortunately I had a couple of photos of my garden on my phone that I could show her – isn’t modern technology marvellous? 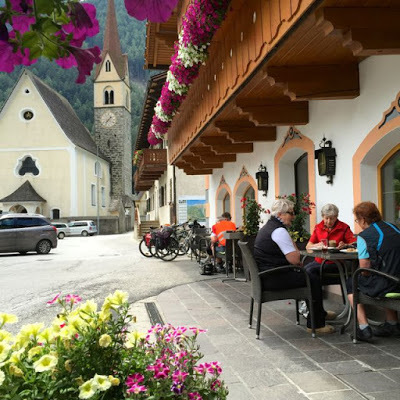 Our journey south took us along this lovely valley past hillsides that become a snow covered playground in winter – Bressanone deriving much of its income from all things snow and skiing. The ski fields rolled down to verdant farmland, orchards and then vineyards – I knew when we were approaching them because the stink of fungicide began to fill the air, which was to be repeated through every wine growing area we cycled through all the way to Verona. NOTE: Why is it traditional to plant a rose bush at the head of every row of grapes in a vineyard? Because roses also get attacked by fungal diseases and they act as a ‘health’ indicator to the grape grower. The very picturesque countryside along the way provided some equally picturesque villages for rest stops and refreshment. As usual for the early part of this trip, we ended up with some pretty average tucker simply because we didn’t know the ropes as far as what to expect and being unable to decipher the menu – still, we knew that Italy – the ‘real’ one – was just around the corner! – a five and a half thousand year old Iron Age man that was discovered about twenty years ago, fully preserved and poking out of a glacier and is now housed in a museum in Bolzano. To be continued!